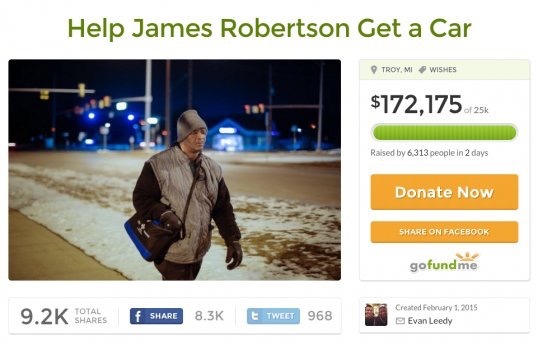 After the Detroit Free Press told of Robertson’s arduous 21-mile trek to and from his suburban factory job, the story inspired thousands of donations from across the nation. A day later, the soft-spoken machine operator got to meet the computer student from Wayne State University who launched an Internet crowd-funding site to gather more than $230,000 — a figure expected to continue to climb today. I love social media. Never before could this kind of thing be achieved. God bless him.